CluedIn » October 18th, 2016, 7:26 am wrote: That is a great thought, SCS, and one I've had myself recently. I've been meaning to start looking at vicsims over the years, to see if any pop out at me as having been portrayed as others recently. Yes, I do think it's worth a look every now and then to see what kinds of imagery appears (and disappears) from the various "memorial" sites. Let's be perfectly clear. These sites are not meant to be viewed with and degree of scrutiny. People see a page filled with faces and they move on. You have to love the Gunmemorial.org phrase at the top of their page that says "Real people, not just statistics". So, is that name pronounced "Fake-All-Of-You"? Seriously, this stuff is just garbage, plain and SIMple. I must wonder if there are any genuinely killed people archived on this site. What would an authentically grieving family member think if he saw his loved one contained in the midst of such utter digital muck? 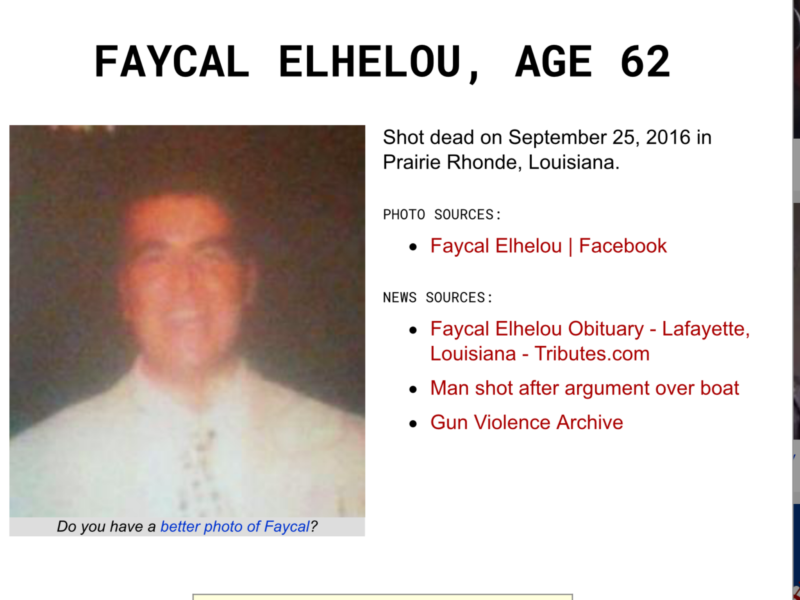 If I had such a loved one killed in a manner categorized as "gun violence" I would demand they Not put them on that filthy website. At best that site is flat out disrespectful to humanity. 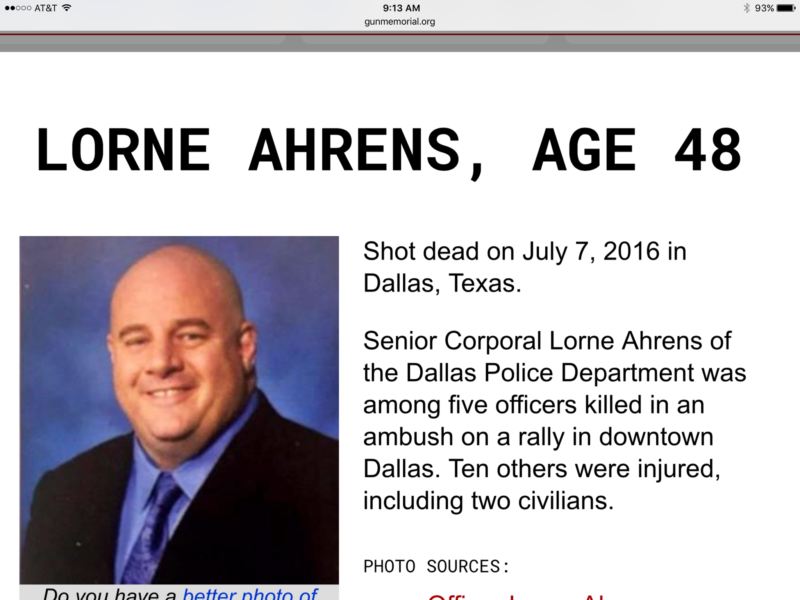 This is the image of Lorne Ahrens, one of the police officers killed in the Dallas psy-op. Now somebody come tell me he was real. I double dog dare you. After a very short time digging for the origination of Gunmemorial.org, it would appear to be a psychotic experiment run by none other than the journalism department at Northwestern University in conjunction with an entity known as Knight Lab. Interesting little project they have going. If you’re reporting local or niche news, there’s a good chance that your audience collectively knows more about the story than you do. That’s especially true for us at Gun Memorial, a small publication with a nationwide mission of covering every American who is shot dead. In our latest, mostly successful, experiment, we let readers add to our stories without editor intervention. This article shares some lessons from that experience. A large fraction of Gun Memorial’s traffic comes from “organic search” and many of those people are friends and family who are trying to follow the news on their recently-deceased loved one. These are exactly the kinds of people that reporters try to interview for the “friends and family mourn” articles sometimes written a day or two after a homicide. 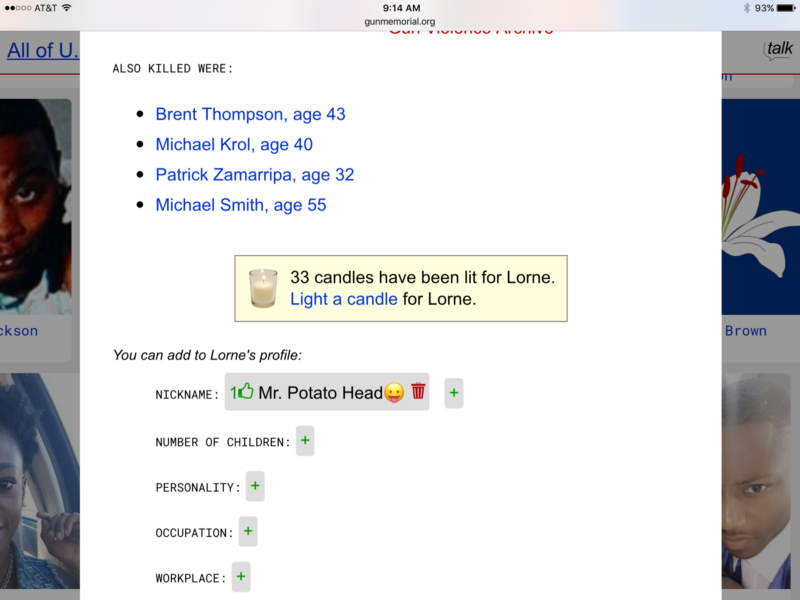 Rather than do real interviews, we introduced a “profile builder” at the bottom of each victim’s page. It is designed to efficiently gather personal and biographical factoids from our readers. 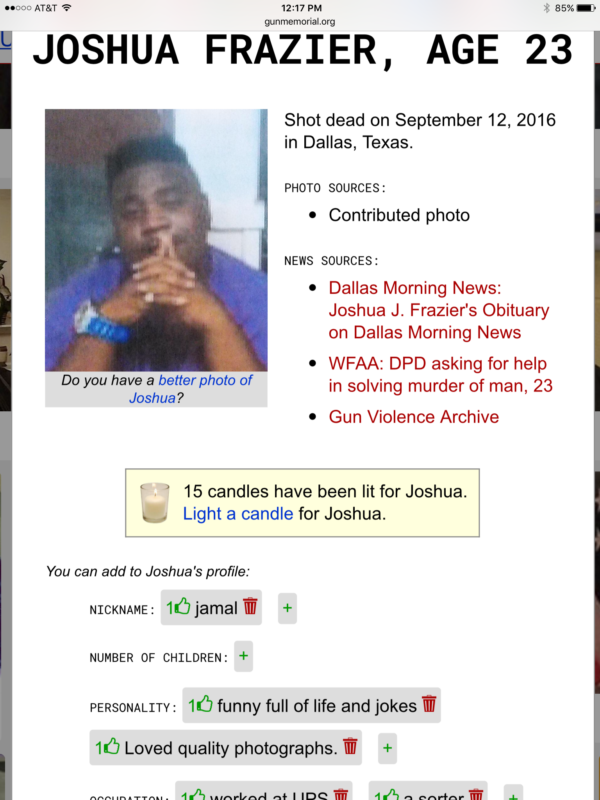 GunMemorial.org’s Profile Builder enables readers to contribute to a page with minimal friction. Vandalism has been minimal and prevented by allowing any reader to delete an answer. Each of the gray-boxed phrases is a response from an anonymous reader and in this article we call each of these phrases an “answer.” Of the six categories of information we are requesting, five are pretty straightforward and factual. The exception is “personality,” which is very subjective, and I’ll talk more about that later. Anyone can visit a page and anonymously change a profile; there is no registration or login and that should encourage participation. We prevent vandalism and misinformation using a simple, anonymous moderation system; readers can either “like” or “delete” others’ answers. The number of likes is shown in green next to the “thumbs up” icon. On the other hand, an answer is removed from the page if any single reader chooses to “delete” it. Thus, a vandal’s work is very easily removed by anyone who later visits. In the first 20 days since the profile builder launched June 30, 2,364 answers were posted, 1,744 likes were recorded, and 249 answers were deleted, including 72 which were deleted by the same person who posted it (presumably as a correction.) For reference, in the same time period we had 339,000 pageviews from 45,000 sessions, and our popular “light a candle” feature was used 14,332 times. Overall, the answers were very effective at humanizing our stories. Readers wholly ignore the rules of grammar, spelling and punctuation, but they nonetheless do a great job of painting a picture of the deceased. He loved his family. He loved to make people laugh. Amazing woman, mom and grandma! went above and beyond for everyone she cared for! amazing! outgoing! and LOVED her girls! I found only five cases of vandalism which were not already deleted by readers. One of these vandals actually spent hours over several days posting dozens of answers to random pages. Two other vandals seemed to know the deceased and to harbor spiteful feelings; I expect to see this for murder-suicides in particular. Popular pages will be cleaned up by their readers, but unpopular pages may remain vandalized, so I started personally reviewing all new answers each day. This is a quick task, taking one or two minutes to scan through a list of 100 answers and click any inappropriate ones. One very popular page was answered entirely in Albanian and Italian. Google Translate does not work very well on this dialect of Albanian. I am unable to effectively and efficiently review these answers, but this particular page has enough readers to moderate itself. Our original launch included a seventh, multiple choice question to categorize the incident as: suicide, accident, domestic violence, police shooting, workplace shooting, stray bullet, road rage, armed robbery, justifiable self-defense, or “other homicide.” In practice, many people were confused by the definition of each category and the absence of other categories. One mother was extremely upset when she accidentally marked her son’s death as a suicide and couldn’t undo it. Our response was to simply drop this question for now. I suspect that this categorization will have to be handled by our editors. We can use the same moderation mechanisms for these longer-form contributions. I can’t wait to see what our readers have to say! In addition, how do they verify when they aren't taking randomly solicited answers? How do you verify that the photo is correct? Aha. So it's sure to be accurate then! Using the news and Facebook! The use of the word "and" with the source "Gun Violence Archive" is also rather ambiguous. Are both sources compared, or could it be either, really? In any case, as SacredCowSlayer points out, the thing is a rather creepy, exploitative database. If you go to Gun Violence Archive (http://www.gunviolencearchive.org/) you will see that "source" is always from those "trusted" networks that lie to us on a daily basis, for cash and profits and protection by the military. Are real victims and supposed victims alike gathered from anything besides the reported deaths from any location at all within America? Such a project would seem to be crying specifically for State intervention on a Federal level. If you're really into destroying any semblance of real democracy, technocratic decisions of a wealthy super class thinking themselves superior, or you just like to reinforce propaganda, you might thank Stephen P. Tarzia for being a gullible sell out that just wants to impress authority with his programming. Hire him today! I'm making an effort to save all I can before this sick Gunmemorial.org gets taken down. In addition to others I've posted on, I find ones like this simply testing the limits of human credulity. Any guesses on how long before this "memorial" site gets quietly scrubbed from the webs? There's no telling how long they will allow such an embarrassment to stay up. If people can't see this then there's not much else we can do. I only post this here in the Anatomy topic because I find the whole idea of such a "database" very disturbing. Seriously, how would one go about compiling the daily body/head count of victims of "gun violence" in a respectful manner while allowing any random person or thing to describe the victim? I'm genuinely puzzled by the premise of the entire project. Are we supposed to think it's normal to prop one's dead relative up for a good digital beating like that? I’d like to take a brief moment to thank the psychotic bastards in the govern-media for giving away (via their Brain Foxing Machine- my term, invented for a more “family friendly” environment here, as my children read this forum), and tying so many of their outright SCAMS together with their recent Vegas freak show. A special thank you to our distinguished member CluedIn for this post (below), which, to me, ties together and cements 9/11, the OKC “bombing”, and the Vegas freak show as nothing more than pure and utter garbage not fit for human consumption, let alone a society. Given the scope of this post, I was conflicted as to where it belongs. I only chose this because it has become a recurring theme, and indeed a part of the Anatomy of the mass deceptions inflicted on the people of the world. What a miserable and pathetic life to “live” for the likes of creatures like this “Mike Dempsey” character. Absolutely deplorable in every way. And that’s an understatement as my words fail me at the moment. Dempsey was in the World Trade Center on September 11, 2001. He escaped after the first plane hit, but was taken to the hospital with a fractured skull after being trampled. The memory of people running for their lives came rushing back in Las Vegas. His first thoughts on Vegas: “It’s a devastating incident,” he continued, “and really a reflection that we need to have change and really do something. First, help the victims and survivors but also really make some to change out this, and make some good come out of this horrific event. Mike Dempsey is a founding Board member for the WTC United Family Group, which is now known as The September 11 Education Trust. Mike coordinates programs such as the Oklahoma City/September 11th Family Exchange which is a mutual peer support program, which unites the September 11th community with the members of the Oklahoma City bombing community held each year in April and September. Throughout each portion of the exchange, peer support activities are held to promote healing and connection, and include support groups, panel discussions and visits to respective memorials and commemorative ceremonies. Mike was also a member of the Coalition of 9/11 Families from 2003-2006. Mike Dempsey has been a director at KPMG for the past 5 years in the Operations Risk service line specializing in operational risk, enterprise risk, and third party risk management. Mike joined KPMG from the Federal Reserve Bank of Richmond where he was the lead examiner and team leader for Large Bank Supervision based in Charlotte and a member of the inter-agency Basel Qualification Team. Prior to the Fed, Mike was regional head of Operational Risk and global head of business continuity at Hypo Real Estate Group based in Munich, Germany and Depfa Bank based in Dublin, Ireland from 2007-2009. Mike holds a Master of Business Administration in Finance from Nova Southeastern University. I am posting this here because I don't know what to do with it. I believe it may be important for newer threads. If anyone can indulge an older man, I would be grateful. "Oh, what a tangled web we weave, when first we practice to deceive!" (Sir Walter Scott, 1808). It is my contention that such deceptions must, if to be used to control others (which they are) , then they must be engineered to so do. 3A skilful contriver or originator of something. This is the thrust to which I apply my posts here. My own personal view has always been to condemn others for trying to control me.